Back row, Lesley Tello, Ethan Costin, front row (l-r) Denise Kokot, gift card winner Valerie Capella, and Katie Hoffer. 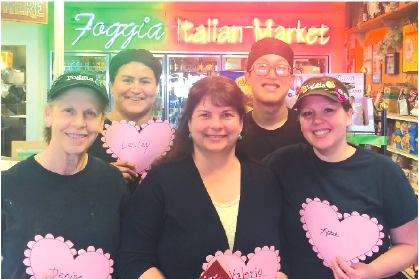 During the month of February, Pathways Volunteer Hospice partnered with Foggia Italian Market & Deli as part of their Have A Heart Campaign. Their goal was to spread the word about Pathways’ programs and services that are offered free of charge to the community and to encourage donations to support their good work … all while enjoying great food. All those donating on-line to Pathways were entered into a drawing for a $50 gift card to Foggia. Valerie Cappela of Lakewood was the big winner. She was especially excited to win because she reportedly eats at Foggia once or twice a month. Her favorite dish is the grilled chicken salad. “We love this opportunity every February to draw attention to some serious subjects that affect everyone of us, and hopefully make some new friends and donors in the process,” stated Cindy Skovgard, Pathways Executive Director. Foggia owners Bob and Linda Quarto have been long time supporters of Pathways, not only with the Have a Heart Campaign, but with many other programs as well. Pathways’ provides hospice care, caregiving for the frail-elderly, grief support, and counseling for children, young adults, and families. They extend a helping hand to local schools by providing crisis response when traumatic incidents arise. And, they offer case management and volunteer companions at no cost to their clients. To learn more about Pathways Volunteer Hospice please call 562-531-3031, or visit www.pathwayshospice.org for more information on their programs and volunteer opportunities. Foggia Italian Market & Deli is located at 5522 Del Amo Boulevard. Call them at 562-627-0987, or www.foggiadeli.com.